So wait, you are actually BUYING MORE? Is it intervention time? Please, always make sure that the "salty licorice" actually contains ammonium chloride. That's what makes it proper salmiac (and delicious). Looking at the first picture it looks that those were not the only salty liquorices in that display. The "Salzige Heringe" I think might also be salmiac but that is just how I understand the name with my limited command of German ("Salty herrings"). The blue "Finnish soft liquorice" is probably salmiakki as well. you shouldn't buy the German stuff. In Germany, liquorice is usually not this salty. though I have never tried the "salty herrings". There is also sweet stuff from Haribo, i.e. 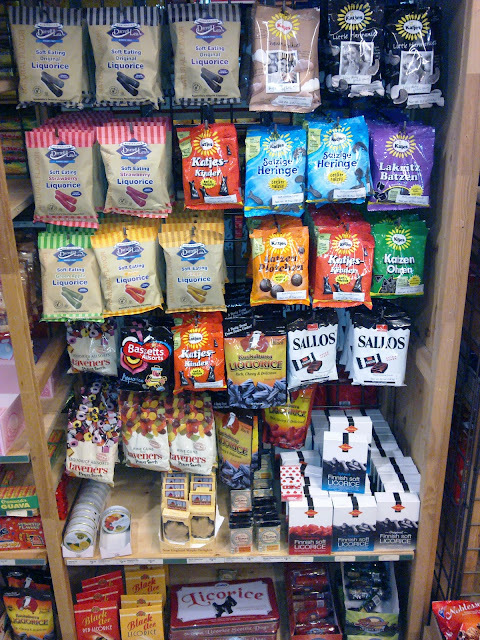 a combination of real candy (usually very colorful) and soft sweetend liquorice (black). stick with the Scandinavian stuff if you're into pain... there's also ice cream if you don't want to miss the taste during summer. Try the stuff in the boxes on the lower right. Loads of real ammonium chloride. The blue box on right side down looks right something decent ;D You should try it out for me, please! "Eating 100g of pure liquorice a week could affect a child's development Pregnant women who eat large amounts of liquorice could negatively affect their child's intelligence and behaviour, according to research." Like many have said salty licorice is not salmiakki. Usually it's kind of salt covered licorice candy where actually the candy part is sweet not salty at all and it doesn't necessarily contain ammonium chloride at all. I wouldn't consider anything that goes with a name salty licorice as salmiakki. It's just a totally different thing. Salty licorice is something that even my foreigner friend actually liked and decent salmiakki was something she couldn't eat at all. So there is a huge difference. 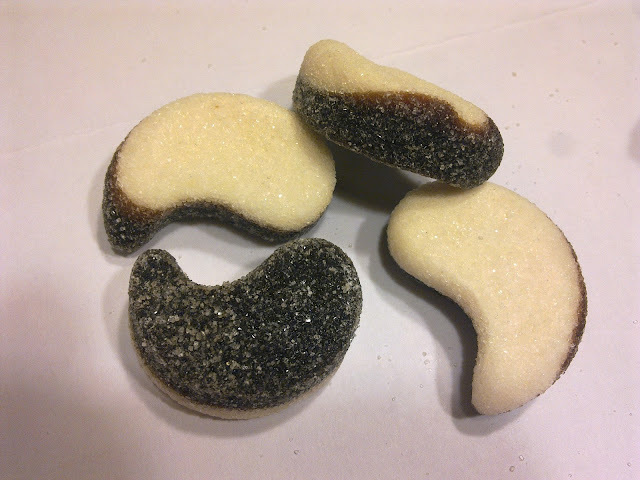 German sweets with licorice taste, not finnish salmiak. So the "edible" rating does not break a rule. The Salzige Heringe are quite sweet stuff too, if you know real salmiak. Been too long without a post Alex, you need to go back to this store and buy some more stuff! The Salzige Heringe bag is labeled "Lakritz mit Salmiaksalz," by the way. I made a trip to the nearest World Market and bought a bag of it, and also a box of Halva Salmiak, the blue-and-white box in the lower right of the photo. A week before, I had tried Katjes Lakritz Batzen, a milder (but still salmiak-salted) licorice, and was hooked. I almost wiped out the entire bag of Salzige Heringe before I got home! I still had a few left, so I compared it with the Finnish-made Halva. The Halva is a bit softer in texture and more intensely flavored than the Salzige Heringe... and now I'm even more hooked. You need to make a new post or I'm going to end up buying these every time I check if there has been a new post! 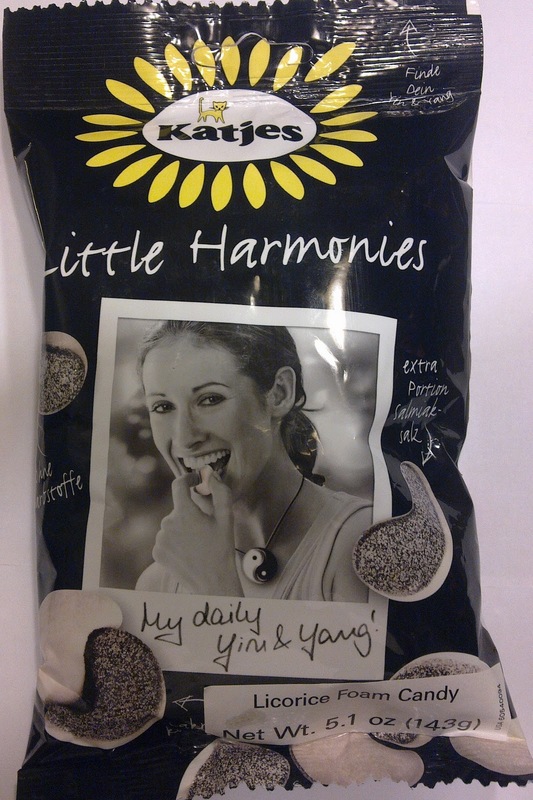 I am craving Little Harmonies so bad right now! Cost Plus has sold out. I can't find in on the internet unless I pay $29.00 shipping fees. If you didn't finish your bag could I have the rest?